START YOUR DIVORCE IN 15 MINUTES. 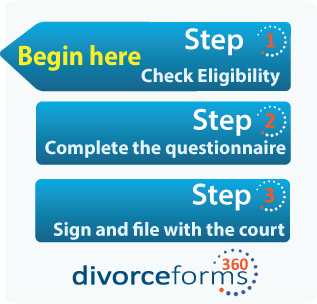 We make the divorce process simple, fast and affordable. My divorce went through perfect. Thanks for all the help. We did the joint divorce and it was completed in just under a month. You guys have a great service. Well, I just wanted to drop you a note to let you know my divorce was finalized yesterday. 2016 will be a great year for me. Thanks for all the help. My divorce was finalized and I just wanted to let you know that I appreciate all the help you gave. I never did a divorce before, and you made it easy for me. I will recommend you to anyone who asks. Hi, my divorce is finally over. I got the divorce decree in the mail today. I has been a long time waiting for this divorce and I so happy for all the help you gave me with filing the documents. Tell Judy thanks for her patients with me! Divorce was finalized today. Thanks for all the help. A quick email to say thanks for all the help. You guys have a great business! Attorney Quality Divorce forms for only $149. We never sell "automated" divorce forms. Our documents are prepared by an experienced divorce team who prepares your forms specifically for your individual situation. Save thousands over expensive attorneys. Dedicated account representative helps you through the process. We stay with you through the entire process, to help guide you through the divorce process. Praised by courts across the country. Fast process. Submit your order today and file your divorce tomorrow.